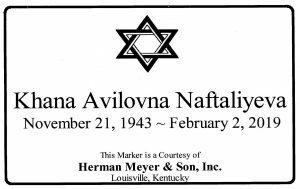 Khana Naftaliyeva, 75 – Herman Meyer and Son, Inc.
Khana Naftaliyev, 75, died Saturday, February 2, 2019 at Baptist Health Hospital. She was born November 21, 1943 in Russia to the late Avil and Batio Danilovs. She was preceded in death by her husband, Isi Naftaliyev. Khana is survived by her sons, Anatoliy Naftaliyev (Izabella) and German Naftaliyev; her daughters, Yelena Naftaliyeva, Sofia Ifraimov (Mark) and Valentina Naftaliyeva; seven grandchildren and one great-grandchild. Graveside services are at 4:30 p.m., Monday, February 4, 2019 at Anshei Sfard Cemetery, 721 Locust Avenue.